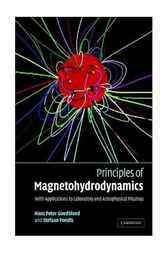 This textbook provides a modern and accessible introduction to magnetohydrodynamics (MHD). It describes the two main applications of plasma physics, laboratory research on thermo-nuclear fusion energy and plasma astrophysics of the solar system, stars and accretion disks, from the single viewpoint of MHD. This approach provides effective methods and insights for the interpretation of plasma phenomena on virtually all scales, from the laboratory to the universe. It equips the reader with the necessary tools to understand the complexities of plasma dynamics in extended magnetic structures. The classical MHD model is developed in detail without omitting steps in the derivations and problems are included at the end of each chapter. This text is ideal for senior-level undergraduate and graduate courses in plasma physics and astrophysics.